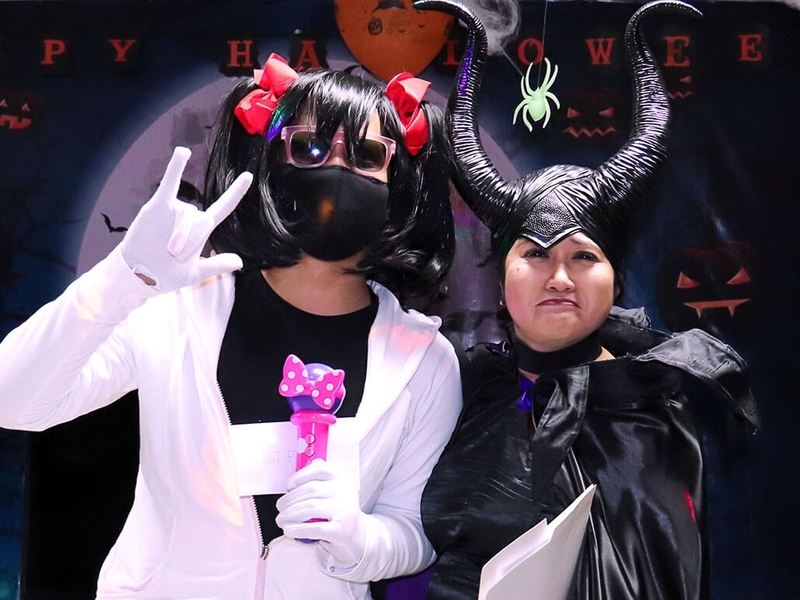 Wackily wicked wear, ghoulishly great games, and devilishly delightful dinner – all these and more made this year’s LeadYa Halloween Bash a spooky night to remember! 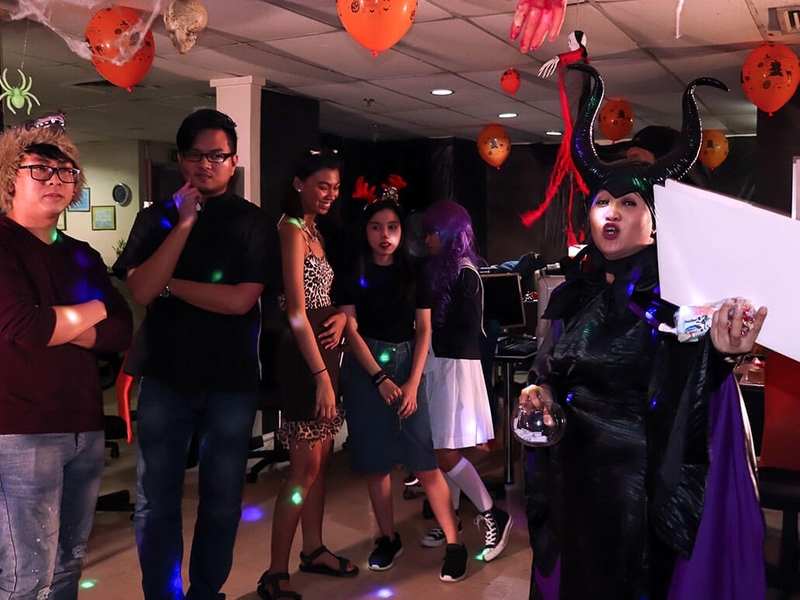 A few weeks before LeadYa’s Halloween celebration, the office started to appear spooky because of the thematic decoration. 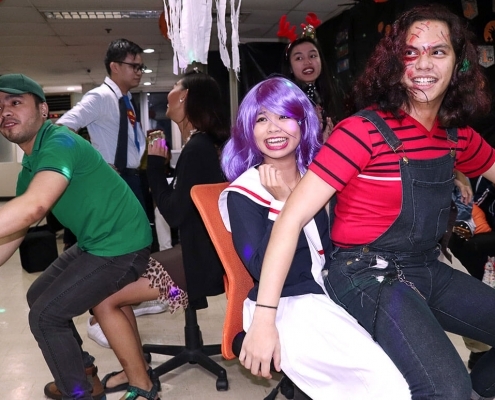 Upon entering the doors, you would feel chills crawling down your spine at the sight of spiders, cobwebs, glow-in-the-dark skeletons, and other ghoulish accents for the company’s Halloween bash. 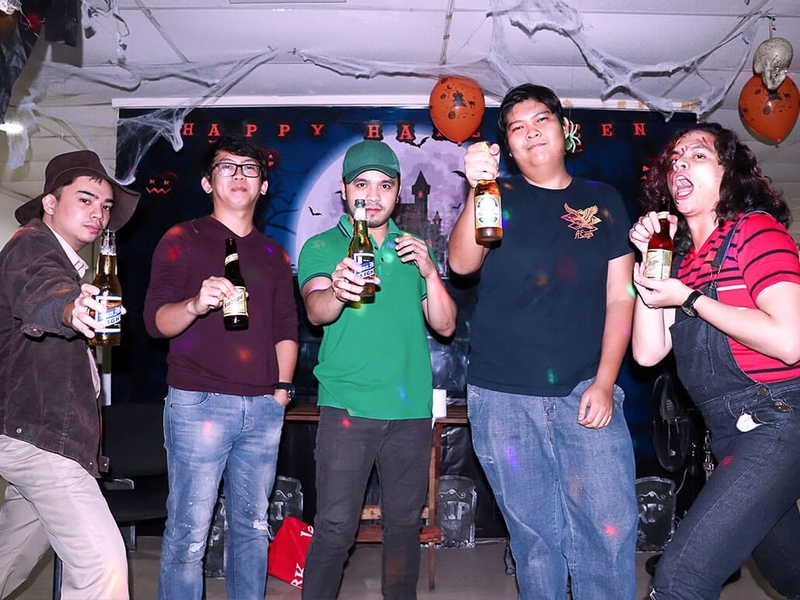 The creepy sight even intensified as the 31st of October arrived. 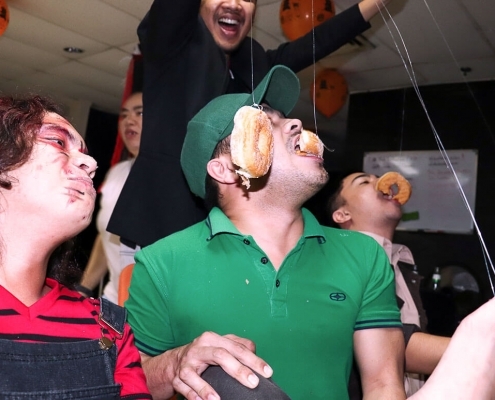 The walls turned black, the ceiling got filled with orange balloons and decapitated hands, a certain floor area became a burial ground with tombstones, and the pantry transformed into a bat-filled cave. As the sun set for the last time in October, the entire LeadYa family evolved into different characters. 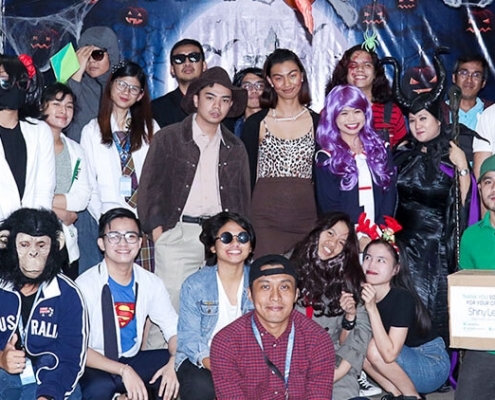 Throughout the night, chic and horrifying characters roamed the halls of LeadYa as though they were souls searching for their bodies. 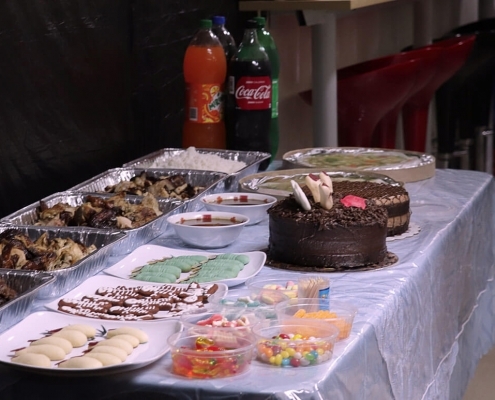 But in reality, they were just biding their time to be in for the fun…and food too. 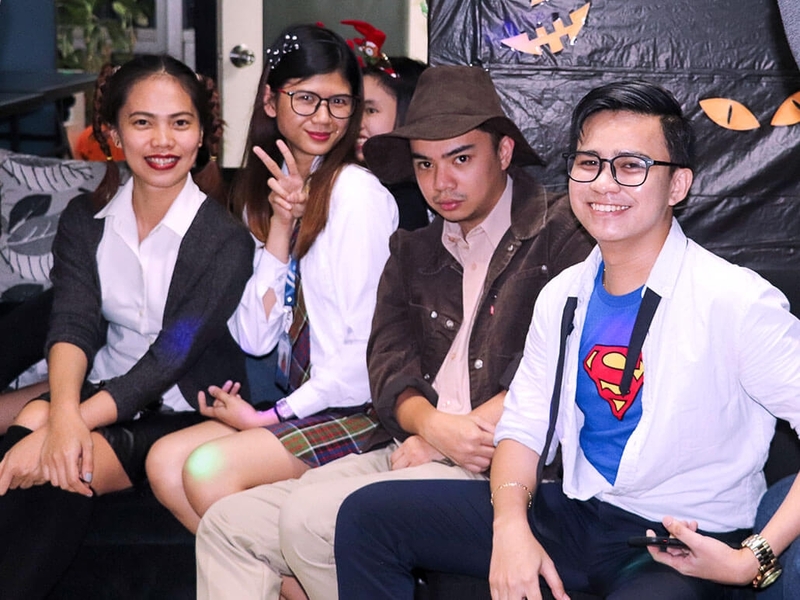 For this year’s party, coincidentally, four members of our LeadYa family dressed up as school girls. It was as if the same spirit whispered in their ear to do so. 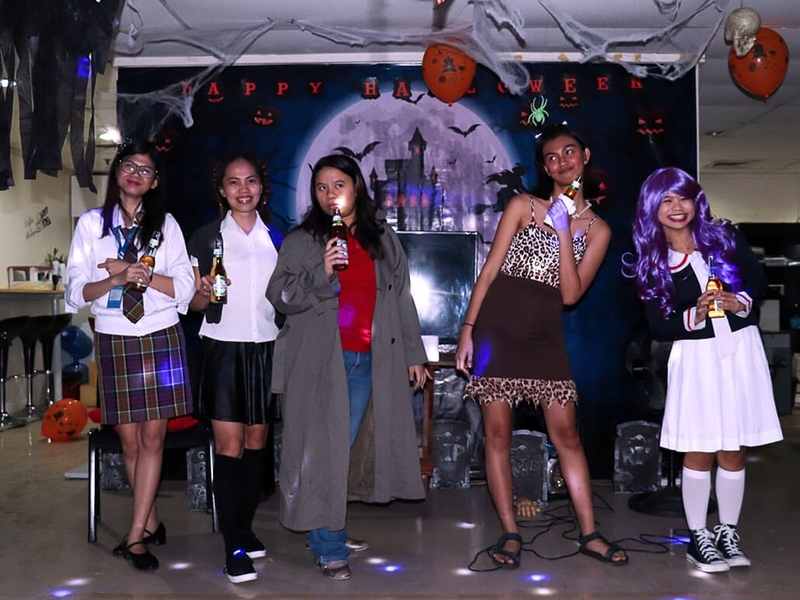 There were different versions of the costume: there was Janine as Baby One More Time Britney Spears, Hannah as a senior high school student, Rainee as Tomoyo Daidouji from Cardcaptor Sakura, and our star of the night, John as anime school girl Nico Yazawa from Love Live! Of course, not all thought of dressing up for school. 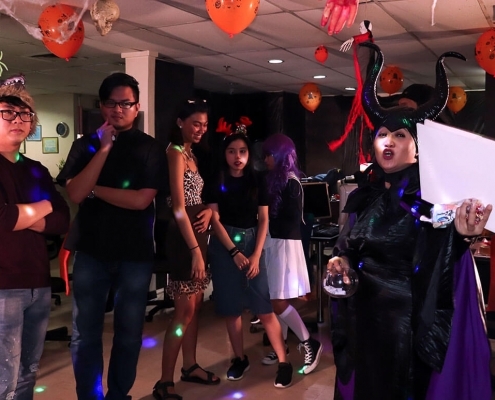 Ehm, the head organizer of the party, came majestically villainous as Maleficent. 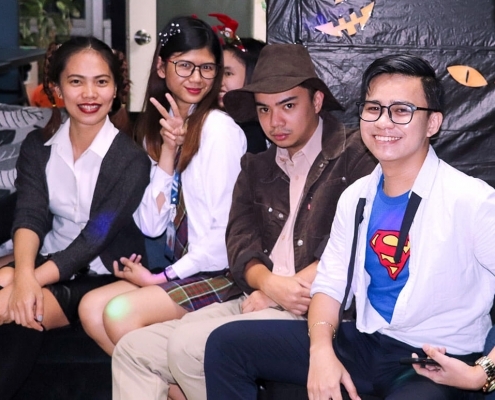 Kamille went as Hagrid from Harry Potter, Kevin was Clark Kent, Gelo was a safari ranger, and Kleona was a cave girl. Jonas even effortlessly came as a Shiny Leaf delivery boy with his matching green shirt, cap, and Shiny Leaf box. The whole gang was dressed not-so-scary apart from Zach who came in as the serial killer doll Chucky and Ian as “murdered long-haired Zach” with a knife-through-skull headband. With all of the great selections this year, the best costume awards were given to John and Zach! John was a total Nico Yazawa package. He was so in character with his complete uniform, wig, and scepter. 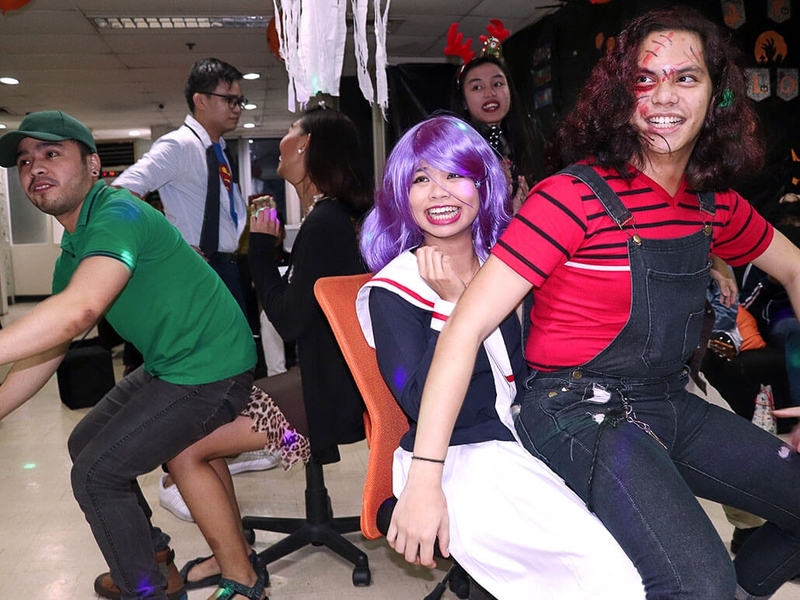 Meanwhile, Zach was serving a full-on Chucky look with his red (naturally) frizzy hair, scarred face make-up, and denim overalls. 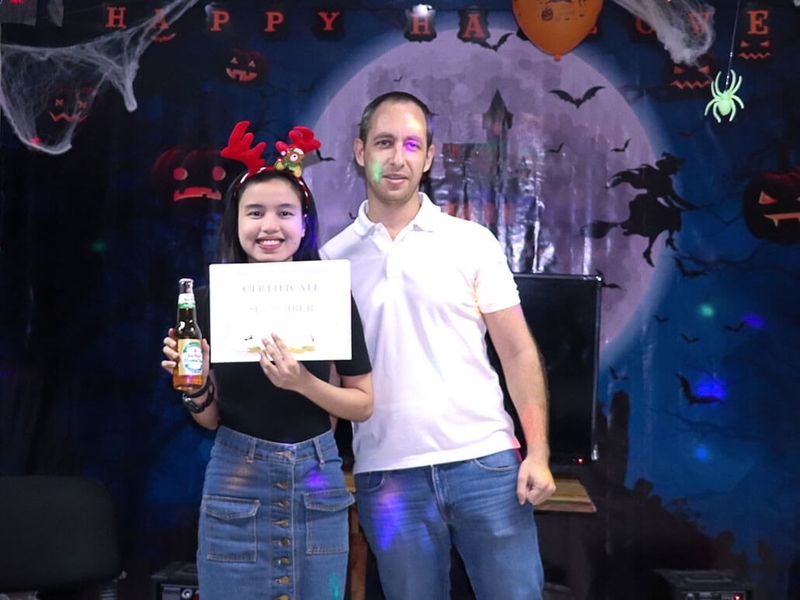 The program started with the monthly staff meeting during which important announcements were made. Fast forward. The higher level of fun began when the first game kicked off: Trip to Jerusalem (with a twist!). The players had to dance with the music and sit in partners on the chairs provided each time the music would stop. 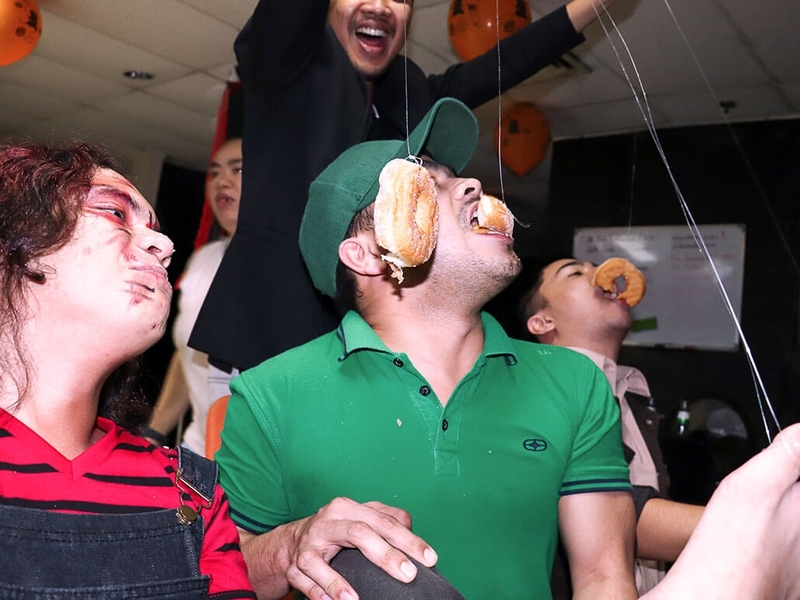 We also played a version of Game Ka Na Ba?, Charades, Magic Carpet Ride, Beer-Chugging Contest, and Hanging Donut-Eating race! 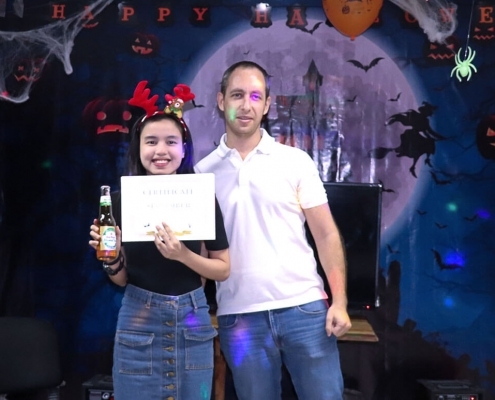 We had so much fun bonding with one another through the laughs, drinks, and crazy games. 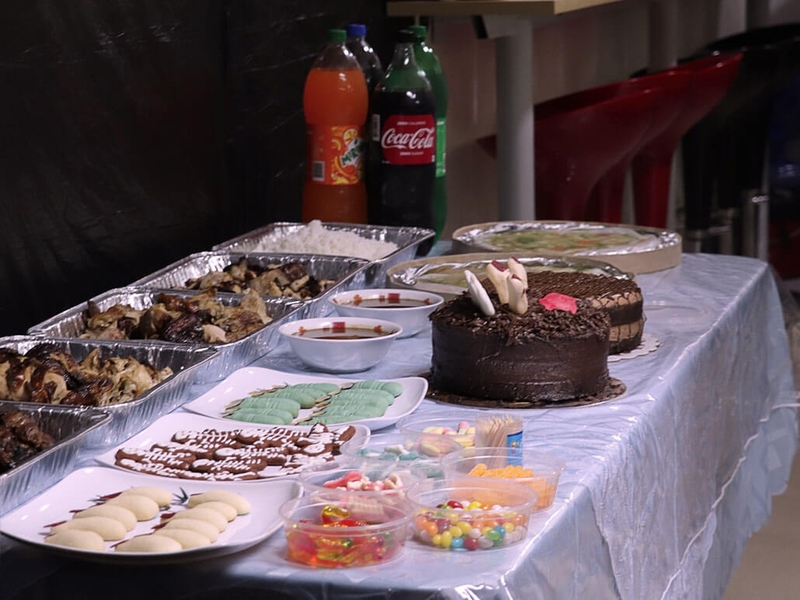 The winners got loot bags filled with chocolates and other sweets, but the treats did not stop there as the management generously prepared us dinner. 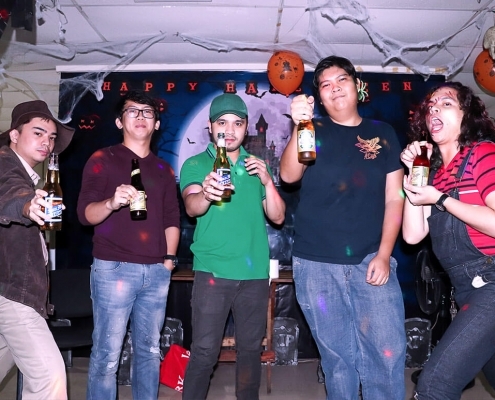 Halfway through the party, we got to fill our bellies with scrumptious food: roasted chicken, barbequed pork, chocolate cake, Halloween-themed cookies, saucy chop suey, yummy gummy worms, and of course, ice-cold drinks! 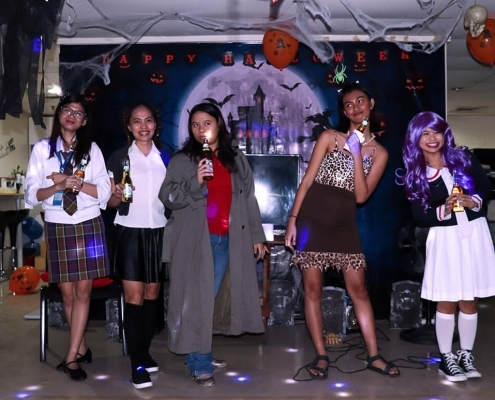 Angelica, Kamille, Janine, and John boogied the night away to Michael Jackson’s Thriller. Meanwhile, most of the group brought out their instruments for a serenade. 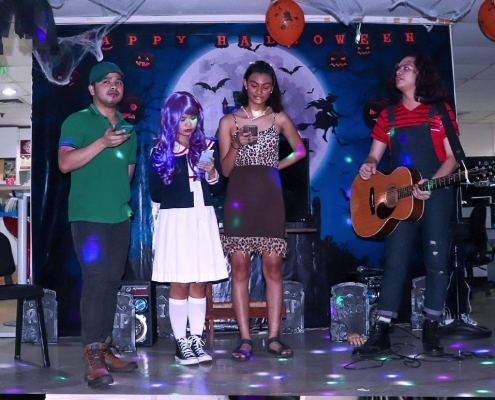 Michael, Irish, Denise, and Zach had a mega acoustic session as they sang Ang Huling El Bimbo. LeadYa’s newest employee, Denise, gave a solo ukulele performance with her own rendition to the 2004 song Weak. CoinPoint’s Content Team consisting of Jonas, Rainee, Kleona, and Zach sweetly sang Maybe the Night. After all the intermission numbers were ticked off the program, the lights were shut off, and the TV was turned on to show the horror flick of the night. The chosen film this year was the 2008 Thai horror movie, 4bia. We all got comfy and moved our seats toward the screen. Some of us were fearless thrill junkies who liked to anticipate each jump scare, while some found refuge from scare behind pillows. The night was truly one for the spell books. 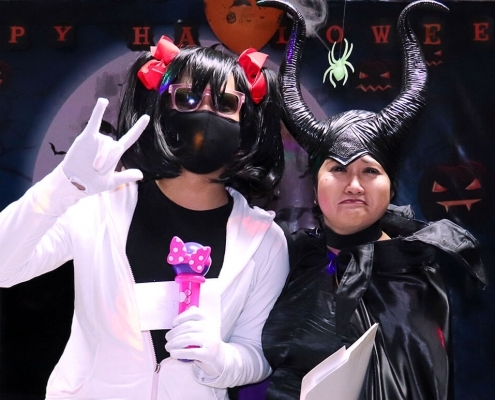 The fun activities, delicious food, great performances, and special company would probably be hard to top off by the next LeadYa Halloween party.